Lighten the administrative burden of running a corporate rewards program. The Organizational Structure and Advanced Reporting Module simplifies rewards program management, access, billing and reporting. Need to keep different organizations, regions or departments in your program organized? Managing a corporate rewards program with different organizations, regions, departments or teams doesn’t have to be hard! In today’s complex markets, many companies rely on a large network to stay successful. If you’re a B2B company, you need to alignment and cooperation of distributors, dealers, contractors and more. 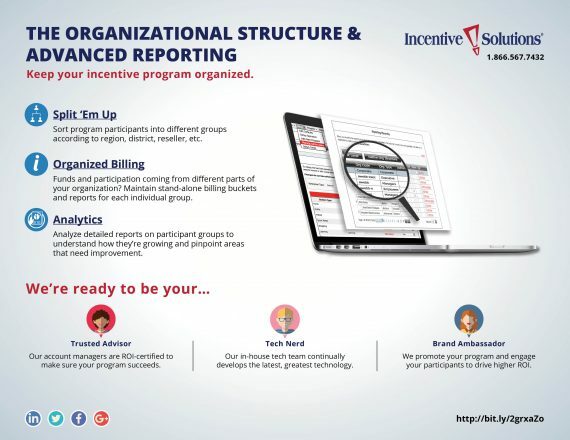 With the Organizational Structure and Advanced Reporting Module, you can segment these groups in your corporate rewards program and separate their reports, billing, and program management and access so life is easier for everyone involved. What features and benefits does Organizational Structure and Advanced Reporting Module include? Segment different groups according to their organization, distributor, dealer, region, department, team, etc. Regional, distributor or department managers access and manage their own segment of the incentive program. Maintain separate billing buckets for each participant group. Organizational Structure and Advanced Reporting can help with these pain points. Which incentive program types should use The Organizational Structure and Advanced Reporting Module? Not all employee departments are created equal. Allow managers of different teams or departments to focus on their own reward program goals, budgeting and reporting. Sales leaders know the challenges and strong points specific to their sales teams. Put them in charge of boosting sales motivation and tracking incentive program goal progress. Different distributors, dealers and contractors have different needs, goals and marketing strategies. What works for them? What doesn’t? You can compare their performance to other channel partners with separate activity and billing reports. The Total Recognition Suite includes a social media wall where rewards program participants can recognize and congratulate each other for their success. Allow segmented social media wall interactions so different participant groups can recognize each other within their own “bubble.” Learn more! Customers from different distributors or regions may have different buying habits and product demand. Keep them separate with Organizational Structure and Advanced Reporting so you’re not comparing apples to oranges when you review performance. Organizational Structure and Advanced Reporting works well with these modules. Give each manager or leader in your corporate rewards program a bank of paper or electronic Quick Points reward certificates, so they can distribute reward points at their own discretion. Learn more! The Performance Tracking Module allows you to schedule, track and manage different sales promotions so you can better organize and track the sales performance of all your incentive program participant groups. Learn more! Allow different participant groups to have unique leaderboard rankings specific to their district, dealership, department or team. Learn more! The Learn and Earn Module offers quizzes, surveys and daily trivia to increase product knowledge and gain marketing insights. You can host custom Learn and Earn content so each participant group in your program has training content relevant to them. Learn More! In a distribution channel, you may not even know some of the customers who buy from you. The Open Enrollment Module allows anyone to register to your corporate rewards program, then you can begin marketing and communicating to them according to their participant group. Learn More!